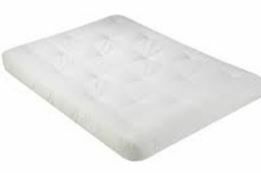 Fairfax spring futon mattress is available in Full, Queen, and Chair sizes. Filled with Fibron Cotton batting and 252 coil innerspring in full size or 299 in Queen. 4 Turn coil is 13.5 Gauge steel, Machine Tufted.